Storing paperwork, financial statement and other vital records are important parts of many businesses. While you may have the option to store some of it on site, what do you do when space is at a premium? At Allstate Moving Systems, we offer more than just moving services; we offer many full-service storage solutions—including records storage and management. What do you get when you choose Allstate? Our all-in-one approach to records storage and management means that you can relax with the knowledge that your files are safe and secure. Your documents are safe from the elements and out of your way, but never out of reach. Long-term storage is never a problem. However, when you have met your document retention obligation you can set a date for automatic secure document destruction, or handle the process on a case-by-case-basis. If you need access to your records in a hurry, we can make that happen—anytime. No matter what your industry and what ethical or legal requirements you may have, we have a solution that works for you. Allstate Moving Systems has assisted commercial and residential clients with their storage and moving needs for over 50 years. With locations in North Hollywood, Ventura, Oceanside and Poway, California, we offer storage locations that are convenient for you. Plus, we make being “green” a goal—we have a recycling program to recycle any shredded product so it can be reborn as a new paper product in the future. 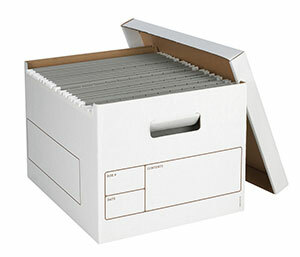 We store your documents in a well-secured location. Our warehouses are all located in safe areas and protected from both the elements and intrusion. We pride ourselves in offering the best level of security possible for your potentially sensitive material; not only does this protect your data, but it gives you a high level of confidence when you need to stop by our facility too. If you are looking for reliable, full-service records storage or you would like more information about the other commercial moving and storage services we offer at Allstate Moving Systems, request a quote online today for a consultation with one of our experts. We look forward to helping you with all your records management and storage needs.